I know what it is to be hungry. Hunger is both a gift, and a tragedy. Could this be what it means to have fellowship with Christ in His sufferings? And could it be that personal vulnerability, and brokenness, and weakness born of raw hunger are prerequisite to being a channel for life and liberty? Is This Not the Life I Have Chosen? It is so amazing that our Lord CHOSE to experience hunger and every other affliction that us mortals have to endure, and much more than we can even fathom of. Amen! To embrace the heightened sensitivity to seemingly unrelated woe…" Amen. So blessed by this post. Worth it? Beyond what our minds can calculate. Ah yes, hunger… pain… is it really to be avoided? 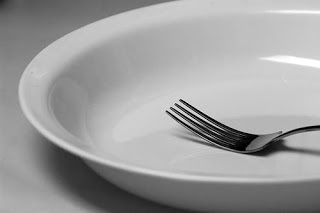 Fasting is something I have not intentionally done much in my life, probably due to high metabolism and a choice to eat food that doesn't cloud the mind. There is, however, an object lesson in the most common reason I may fast for a short time. This happens when I forget to eat. Mind you I do not forget because I am not hungry, it is because I can become so focused on a project that I loose track of time and the needs of my body. Some times several meal times go by without recognition. This makes me wonder, when Jesus was on earth He fasted and prayed often, did He choose to fast or was he so consumed in communion with His Father that He forgot to eat and sleep? That leads me to think… What would my relationship with God be like, what could He do through me, if I was so in love with Him that I forgot to eat breakfast from time to time because I was to busy in Bible study and prayer. Thus my prayer is, God teach me. When physical hunger and fatigue are present, teach me to seek You and not use it as an excuse for irritability. Teach me to be hungry for You.